Hyundai’s first hybrid could offer efficiency above 30 mpg, for thousands below the competition. The all-new 2011 Sonata, a sedan that has so far delivered the kind of styling, efficiency and low MSRP that sends consumers scrambling for their checkbook. Now Hyundai offers the Sonata as a hybrid model that comes loaded with nearly all of the latest and greatest tech to keep fuel consumption at a minimum. 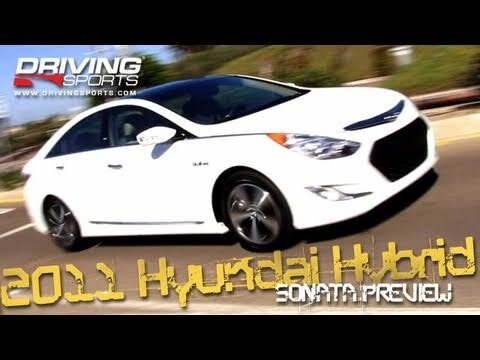 Watch Ryan as he delivers a behind-the-wheel review of the Sonata Hybrid. Hyundai says that the Sonata Hybrid can cruise on battery power alone at speeds of up to 62 mph. How do they do it? Under the hood, Hyundai has converted its 2.4-liter four-cylinder engine to the Atkinson Cycle and added a 40-horsepower electric motor. The duo is good for a combined 206 horsepower and 193 pound-feet of torque, but the real star of the show is the car’s battery pack. Instead of opting for the cheaper nickel-metal hydride cells used in cars like the Ford Fusion Hybrid, Toyota Camry Hybrid and Nissan Altima Hybrid, Hyundai has gone for costlier lithium-polymer cells. The company has crammed a total of 72 cells into the pack, each about the size of a cigar box lid and the weight of a roll of quarters. Throw in all of the necessary electronic wizardry to manage the LiPo goodies and a structure to support them, and you’re looking at a battery pack that weighs a relatively svelte 96 pounds. Hyundai says that the Sonata Hybrid is good for 36 miles per gallon in the city and 40 mpg on the highway.